Pakistani national Rafat Usmani was arrested and detained on 28 May and says that he was tortured the same day. The authorities have since denied holding him in custody, leading to concern that he has been subjected to enforced disappearance. He is in grave danger of further torture or other ill-treatment. Rafat Usmani has lived and worked in the Emirate of Dubai, in the United Arab Emirates (UAE), for over 12 years. Over the course of 2008, he has been in communication with the Office of the Auditors (a quasi-judicial body under the control of the ruler of Dubai, which deals with financial offences) in relation to financial irregularities alleged to have taken place at his former workplace. His representative in these procedures has been an American lawyer. Most recently, he was summoned to the Office of the Auditors at 1pm on 28 May. He was told that the summons was for him to collect his passport and sign a number of forms connected with his application to change his employment sponsorship, which is a requirement for foreign nationals working in the UAE. Rafat Usmani went to the office with his wife and also his brother and his wife, who are American citizens. His brother waited in a car outside the office, while his wife and sister-in-law entered with him. One hour after their arrival the two women were told that they must leave but that Rafat Usmani must remain. They were then told, “We will teach you Americans a lesson.” Later that day Rafat Usmani was brought home by a group of men, some of them in uniform, believed to be members of Amn al-dawla (state security police). They searched the house and took his laptop computer and other personal items. During the search, Rafat Usmani told his family, in tears, that he had been tortured. At that point he was taken away and was therefore not able to provide further details. His family have made extensive inquiries with the authorities, but they have denied having him in custody. Rafat Usmani has a detached retina. He will reportedly lose his sight in that eye unless he takes medicine every four hours. He did not have the medicine with him when he was taken into custody. He also has very high blood pressure and has been hospitalized twice in the last month due to collapsing from stress. 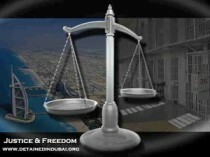 At least two people are known to have been tortured in custody in the UAE in 2007. UAE national ‘Abdullah Sultan al-Subaihat and Pakistani national Rashed Mahmood were both beaten severely. ‘Abdullah Sultan al-Subaihat was also subjected to sleep deprivation, forced to carry a chair over his head every day and threatened with sexual assault. – calling on the authorities to inform his family of his whereabouts without delay and to allow them and his lawyer prompt access to him. COPIES TO: diplomatic representatives of the United Arab Emirates accredited to your country.